With three successful restaurants and a recent James Beard award for her 'Gran Cocina Latina' cookbook, Maricel Presilla's Cucharamama is a litmus for Latin American cuisine. The mille-feuille is nearly a sea-faring slice of meringue, a children's fairy-book concept of dessert — inches upon inches of lofty sweet puffs, layers upon layers of parchment-thin pastry, all whimsically accessorized by a scattering of cocoa nibs. It's so outsized and cloudlike that it surely could carry you off to ancient lands full of adventure and treasure, should you manage not to devour it first. Cucharamama is an homage to those ancient lands of treasure, the lyrical and mystical cuisine of Latin America — seafood in a spicy coconut milk from Ecuador, roast leg of pork from Peru, beef and chicken potpie from Chile. That outrageous mille-feuille — it appears deceptively dense but actually is an ethereal sophisticate — was inspired by a dessert from Argentina, a trip to Mendoza, the nation's premiere wine region. Chef Maricel Presilla adds malbec to the meringue for a depth of flavor, then bakes it off like Baked Alaska to give it a more rustic, less purple hue. She adds walnuts to the dulce de leche, tops it all with cocoa nibs, and suddenly the dessert is far more complex and urbane. Presilla is just as much curator and historian as she is chef. This year, her cookbook, "Gran Cocina Latina" won the James Beard Foundation Cookbook of the Year award. It's an epic book, with an epic premise — unifying the vast culinary landscape of the Latin world. It's a tome, really, with 500 recipes that represent 30 years of collecting recipes, Presilla's personal archive, gathered from conversations and dinners with grandmothers and chefs in villages and cities throughout Latin America. Presilla is an obsessive note-taker — she buys a notebook first thing when she travels, and her home is filled with baskets of notebooks, the cheap dime-store variety, the important leather bound ones. In Oaxaca, Presilla absolutely fell in love with black mole. "We're making more tomorrow," she was told; Presilla returned, took copious notes. In an airport in the Dominican Republic, when flights were delayed in a power outage, a woman brought out a container of sofrito. Sofrito can start a conversation, and Presilla got the recipe. Her years of notes were not intended as an archive. 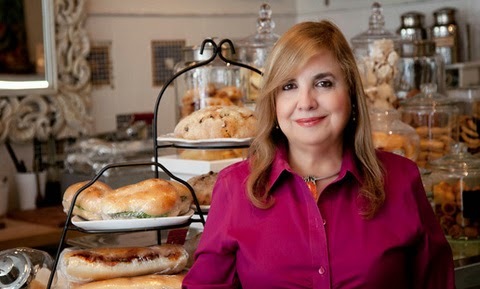 She just wanted to bring those recipes back to her Weehawken kitchen, celebrate them at home. Awards ceremonies unnerve Presilla. The night of the James Beard media awards, she allowed herself a leisurely two hours to get into the city. But the tunnel was backed up, not moving, not even crawling. Half hour, 40 minutes, she had to do something. She stuck her head out the window, dramatically insisting the other cars give her space, made an illegal U-turn and headed straight for the ferry. She ran, in her heels, across the parking lot to catch the boat, a run in a movie scene, just barely making it aboard. She missed the pre-award cocktails, but arrived, perfect timing, for the ceremony. The international book category was first. "I feel like a sixth-grader. I want to go under the table and disappear." She didn't win. The Cookbook of the Year award comes at the end of the night. She had zero expectation. "I thought I had lost." "Gran Cocina Latina" was released just before the hurricane hit, and she had to cancel all those critical early promotional appearances in favor of Clorox and drywall. Presilla grew up in Cuba, is far more wary of hurricanes than most New Jerseyans, but never guessed Hoboken would suffer as it did. Once aware of the flooding, she panicked. Her father's paintings were on the restaurant walls. Her father had just died, she couldn't bear the thought. The Cucharamama floor was itself a work of art, specially commissioned, tile that was hand-painted by a Cuban artist in Miami. Could the floor be salvaged? The water was so high she couldn't even open the door to the restaurant. Today, you walk into Cucharamama and have no idea Sandy was ever there. Despite the insidiously corrosive effects of salt-water flooding, the floor was saved, the paintings undamaged. The menu is an immersion tour of Latin America. "If you come to the restaurant, you eat the book." The white bean soup ($10) is a perfect introduction, a purée of musky white beans with tomato cream, served alongside a cheeky-cute rustic cocktail empanada, a doughy pop of Spanish Cabrelas mingled with sweet onion confit. Other empanadas are just as rustic, the beef version ($9) spurred alive by olives and served with a lusty chimichurri, fresh and generously swimming with herbs. The arepa ($11), with salmon roe and crème fraîche, is a Cinderella dish, the hardworking arepa, frugal but pure, dressed in such elegant opulence. The short ribs ($25) are braised in a red wine sauce, brown sugar and cacao — a showcase for Presilla's love and study of the cacao bean. We found the sauce intriguing, especially the lilt of chocolate, but also heavy — in the way you used to love demi-glace but don't anymore because it seems too cloying for the modern world. The family-style short ribs are sturdy. Anything from the wood-burning oven is a house specialty, thus worth the adventure. The roasted free-range chicken, by the half ($25), is just stunning, another stellar example of rustic Latin fare, in a garlic-bitter orange mojo. For dessert, the panqueque ($8), a Latin American crepe, will impress. But don't leave without the mille-feuille ($10). Business at Chucaramama has been good, thanks in part to the James Beard award; Presilla is glad of that. But she also speculates that success in the restaurant business is less about award ceremonies and more about the study of meringue, less about running in heels and more about recognizing the value of sofrito in an airport. And knowing, as well, to have four pairs of waterproof boots on hand. This review originally appeared in the August 2013 issue of Inside Jersey, a Star-Ledger Magazine.